Entries tagged with “Lindsay Venn”. 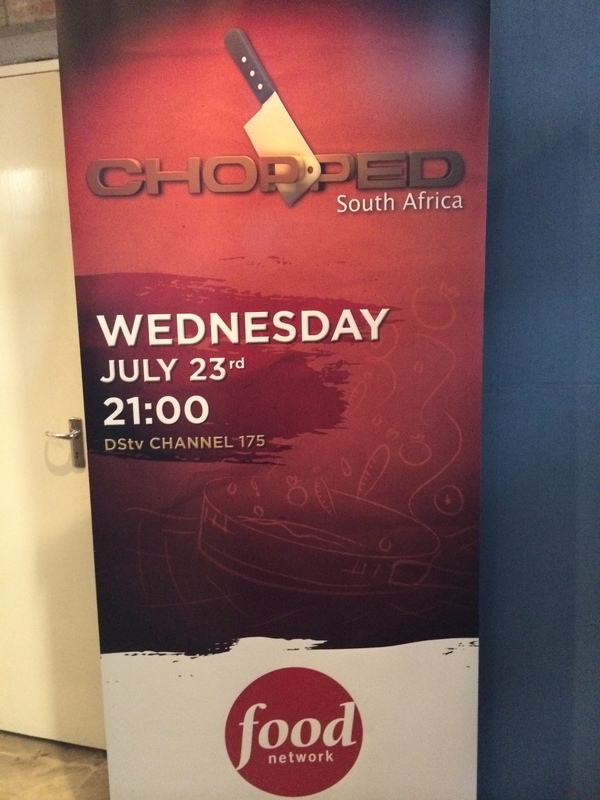 ‘Chopped South Africa’: first SA professional chef reality TV competition show! 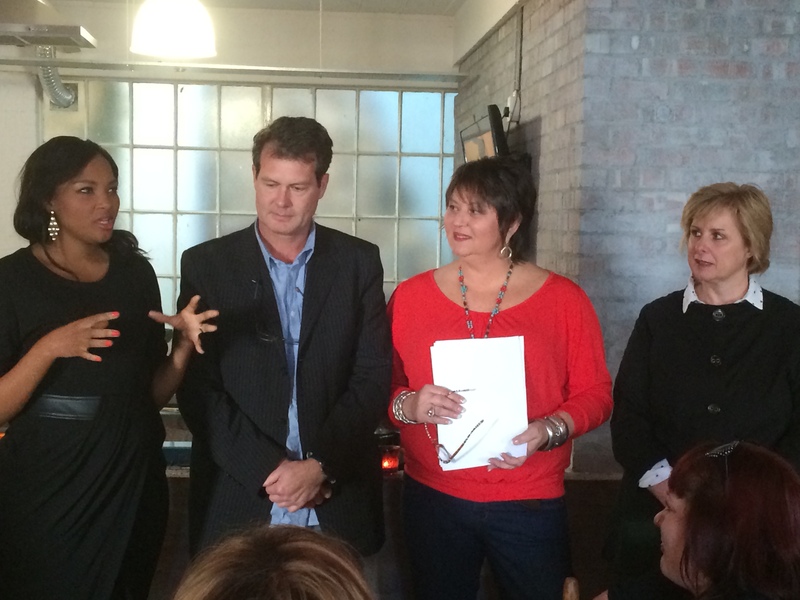 ‘Chopped South Africa’ was launched at Giggling Gourmet Jenny Morris’ studio in De Waterkant yesterday, to publicise the 10 programme Food Network series on DStv channel 175, commencing on Wednesday 23 July at 21h00. 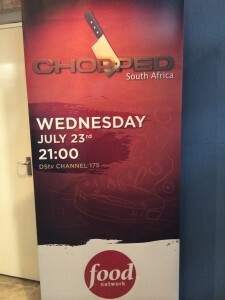 ‘Chopped South Africa‘ is the first professional chef reality TV competition in South Africa, based on the American ‘Chopped‘, but with a South African flavour. It is the first international adaption of the programme, and was created due to the series’ very strong following in our country, with 25000 viewers per programme, I was told by Nikki Cooper, the Commissioning Editor of ‘Chopped South Africa‘, based in London and working with programming for Europe, the Middle East, and Africa. She said that she was ‘blown away by the talent and graciousness’ of our local chefs. Due to the strong support of South African viewers, Food Network is investing in creating content for our country, but with appeal to its international viewers too. We were welcomed by Jacques Verster. He introduced the four judges, being Jenny Morris who has hosted programmes on Moroccan and on Mediterranean cooking for Food Network (and who turned out to be a tough judge, explaining that she wanted to be honest with her feedback, and for it to have integrity); David van Staden, the Executive Chef of the Tsogo Sun Group; Siba Mtongana, who has her own ‘Siba’s Table’ program on Food Network; guest judge Rebecca Hurst, who runs the Hurst cookery school; and guest judge and Chef Lindsay Venn of Tsogo Sun The Cullinan (not in the photograph). We were told how strongly the judges believed in their standards, and fought for their point of view in deciding which chef would be ‘chopped’. Heinz is the main programme sponsor, while Shoprite-Checkers provided all the ingredients for the cooking on the program. * Sir Richard Branson is said to have bought the Mont Rochelle wine estate and hotel in Franschhoek. 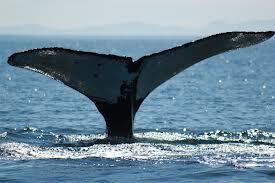 * Tsogo Sun has announced that it plans to bid for a gambling licence for Cape Town, should a second casino be allowed. The hotel group already has casinos at Club Mykonos, on the Garden Route, and in Caledon. * A new reality TV cooking show called ‘Chopped South Africa’ , based on an American counterpart, is to be screened on local TV, and will feature chef judges Jenny Morris, Siba Mtongana, Rebecca Hurst, and Lindsay Venn. Four contestants will feature in each episode, out of a total of 30 chefs. * Buitenverwachting’s Bayten Sauvignon Blanc 2012 has been recommended as one of ten wines for Thanksgiving dinner or to bring as a gift, the only South African wine on the list. Restaurant Review: 1800 Restaurant at Cape Royale still not hot, winter special dishonest! In my Hausfrau past, I was a mean Beef Wellington preparer for dinner parties. When I saw this dish advertised as the new Winter Special (at R 99 with a glass of sparkling wine, until the end of the month) at 1800 Restaurant at the 5-star Cape Royale Luxury Hotel, I had to have it! We had tried the Winter Special almost a year ago, and were disappointed then (read review). Unfortunately our return visit was no different. It started when we arrived – I was finishing a call in the car, and a staff member of the hotel interrupted my call and hassled us about parking, even though we were in a legitimate bay outside the hotel. He was intimidating, and I asked him to step back. Two security staff we walked past upon entering the hotel did not greet us. The manager seated us at a table next to one of those odd “confession” screens, which allows one to be heard, and to hear every word of the table on the other side of the screen, near a drafty entrance to the restaurant. We had barely settled in, when we received a complimentary glass of sparkling wine as a “token of our appreciation for dining with us tonight” – nice touch, but the rest of the introduction sounded straight off a script. When I asked what we were drinking, I was told by the waiter Alex that it was “Kleine Zalze”. From the little I know about wines, I could not recall a sparkling wine made by this wine estate, and asked him to bring the bottle to the table – it was a Kleine Parys Cuvee Brut in fact! The bread was brought to the table immediately, really not exciting at all, and I left it to one side. We received a sermon about the location of the cloakrooms, the meaning of the name of the restaurant (steak is prepared at 1800F), and the menu. The waiter talked us through everything, including the eight special sauces of which one can order one for free, and did not mention the Beef Wellington special we had come for. For the special, there is no choice of sauce – you must have it with the Red Wine jus, as prescribed. The restaurant service is affected by this long introduction to the restaurant, as no other tables close by can be served. I ordered a starter and the special, and the starter arrived within 5 minutes, commendably quick (compared to the slow service for the rest of the evening). I had not even placed the order for the wine. Three spiced salts were brought to the table as well, but the waiter only knew the origin of them (smoked paprika salt from Africa; Sumac salt from Arabia; Allepo salt from South America) but could not describe their taste to us. The focus of 1800 is on steak, and the restaurant’s website states: “Owner, Paschal Phelan, brings with him many years of experience in the meat industry in Ireland, and under his direction, his team ensures the best quality by inspecting suppliers’ farms to maintain the highest standard of their meat offering. The restaurant’s succulent beef and other selected meats are grass reared and then grain fed for a short period to enhance the flavour and ensure tenderness. It is then matured to perfection in the grill room’s temperature controlled storage”. I could not help thinking of Carne when I read this. Prior to the starter being served, an amuse bouche served on a spoon was brought to the table – it was a smoked paprika cheese and mash ball with sweet chilli sauce, a non-event. The starter Duck Rillettes were served on white toast. I was attracted to the description of the dish on the menu: “Duck liver parfait, toasted pecan nut and honey broiche and brandied sultanas”. The toast looked like ordinary white bread, and there was no sign nor taste of nuts nor honey in it, even when the manager brought us an untoasted slice of the “brioche” to taste. The manager could not answer when I said that this was not as described in the menu. The service problem came from there being no heavy-weight manager on duty. Our waiter of last year, Emmanuel, whose service we were not happy with then, now is the manager, out of his depth we felt. The owner of the hotel was also dining at the restaurant, and perhaps the staff had their attention focused on him and his party. The music was far too loud, and not pleasant, but luckily was turned down as soon as the owner arrived. Nothing has changed in terms of the decor in the year since our last visit. The “Beef Wellington” at 1800 Restaurant is not made with pate de foie gras, nor are the duxelles mixed with leeks, nor do they cover the whole steak – a tiny teaspoonful of the mushroom mix was placed on the top of the fillet, underneath the puff pastry, like a crown! The steak was prepared medium, as specified by the waiter. I asked the manager why there was no foie gras, and the answer he brought back from the chef was that it would make the dish costing too high – a con! We felt that the portion of steak also was not close to the advertised 200 gram. When the plate of food was brought to us, the mash and the vegetables on the plate were cold, so we sent them back. The second set of vegetables was extremely salty. The red wine jus had a very rich dominant taste, and I felt that it spoilt the taste of the steak. We ordered the Allee Bleue Shiraz 2007, at R 50 a glass, and while the portion served was very generous, it was not a particularly pleasant wine. The “Wine Portfolio” (nice name) is divided into wine type, and then by wine region within that, with listings of local and international wines. The house wine is a Capaia Blue Grove Hill Sauvignon Blanc (R35/R140), and its Merlot/Cabernet Sauvignon blend (R40/R160). Graham Beck’s sparkling wines are listed under Stellenbosch and not Franschhoek! Champagnes range from R680 for Lacombe and Leillier to R 2400 for Dom Perignon. Some of the wines are expensive, but I counted eight white and seven red wines by the glass that cost less than R40, which is good value, especially as none of the red wine vintages were younger than 2007. One can indulge in such international wines as Giovanni Corino Barolo Vigne Giachini, Domaine Ussegilo Chateauneuf-Du-Pape Imperial Cuvee, Chapoutier St Joseph Les Grantis Rouge, and Alain Chavy Puligny-Montrachet les Purcelles, all upwards of R 1000. The manager could not answer our challenge that serving the “Beef Wellington” short of its identifying ingredient was dishonest. The Executive Chef Jonathan Gargan, who took over the restaurant only about three months ago after service on cruise ships, was not on duty, and his deputy Chad Booysen (ex-Beluga) clearly was not coping with the room full of diners. We knew it a year ago, and we should have known better in returning to 1800 Restaurant. What they are offering as a Winter Special is dishonest, and does not do their reputation, nor that of the 5-star Cape Royale Luxury Hotel, by whom it is owned, any good. The staff and manager need a serious training hand, and the Executive Chef should be on duty on busy weekend nights. The name of the chef of a year ago (Lindsay Venn) is still on the Cape Royale Luxury Hotel website, while the restaurant website does not mention the chef’s name at all! In re-reading my review of a year ago, it is clear that little has changed – the special is not mentioned when one arrives, the service slows down as the restaurant fills up, and the wait for the main course is long. The prices have not moved much compared to a year ago, which is commendable – the price of the 200 gram fillet has come down to R120, that of the 400 gram has remained the same, while that of the 300 gram has increased. The price band of the starters (Paternoster mussels, Franschhoek salmon trout, baby calamari, Kalahari springbok carpaccio, two salads and chicken livers), being R40 – R69, has not changed much. The linefish price has however increased by 19 % to R115, while the cheapest dessert has come down to R28 now, to a maximum of R45. Desserts include ice cream and sorbets, souffle cake, cheese cake and a plateful of miniature desserts. 1800 Restaurant, Cape Royale Luxury Hotel, Main Road, Green Point, Cape Town. Tel (021) 430-0506. www.18hundreddegrees.com. Monday – Saturday. POSTSCRIPT 4/8: Read the reply to this review from Jonathan Gargan, Executive Chef of the Cape Royale Luxury Hotel, in the Comments section.